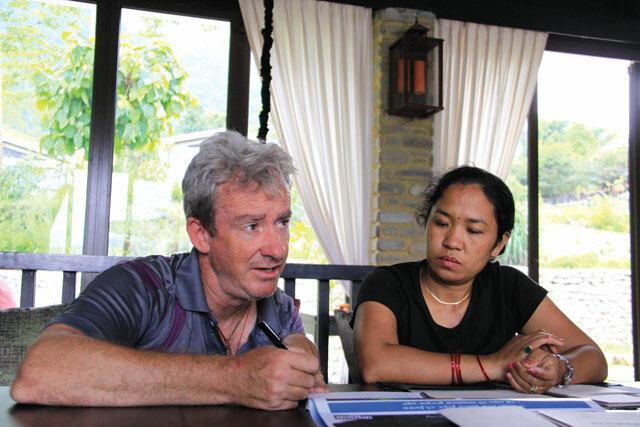 WASTE NOT: Douglas Maclagan demonstsrates how a biogas digester uses hotel sewage and farm waste to fuel the kitchen at The Pavilions Himalayas in Pokhara. 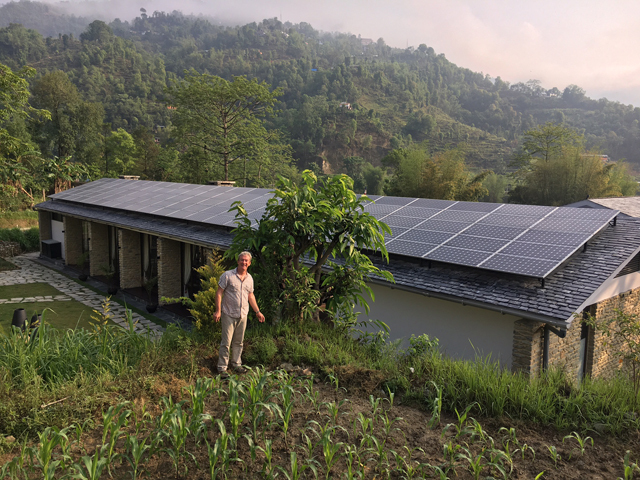 Doug Maclagan has been helping thousands of abandoned children in Nepal with schooling and health, setting up projects to protect the environment and provide vocational training for Nepali youth. So, as he turns 50 after spending half his life in Nepal, the Scotsman should be sleeping more soundly than most of us. But Maclagan says he cannot afford to sleep, there is just too much left to be done. When he first came to Nepal in 1994, Maclagan was struck as much by the fortitude of the people as the neglect of health care in Kaski villages. With his Nepali wife, Insuba, he started raising money to improve medical care, and soon found that the needs of children were even greater. He set up Child Welfare Scheme Nepal and Right4Children in Pokhara. “But as I grew older and older, my donors were getting younger and younger, and I asked myself how long can you keep on doing this,” Maclagan recalls, and hit upon idea of a self-sustaining high-end resort to support social causes. 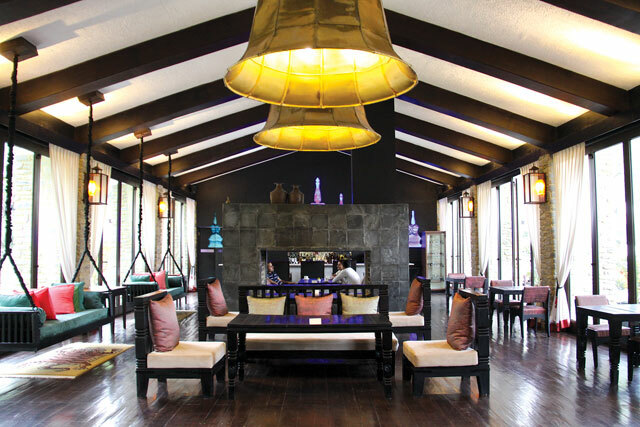 With savings, donations and a bank loan, The Pavilions Himalayas was inaugurated in November 2015 as part of The Pavilions Global Collection that has boutique resorts in Bali and Phuket. 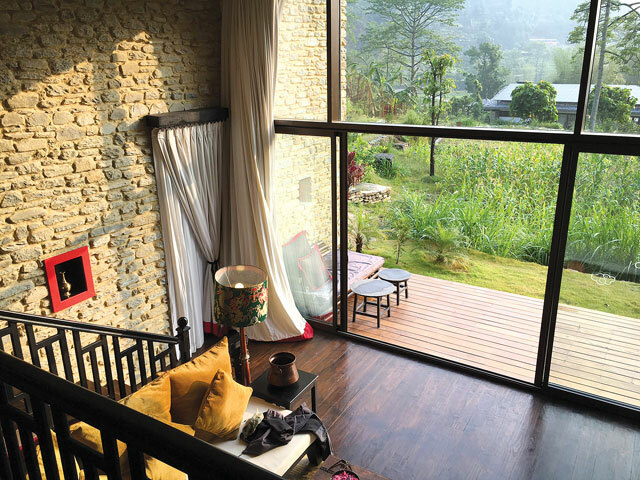 The hotel in Chisapani near Pokhara has already won multiple awards for its designer, Alex Shrestha (see below). As luck would have it, the opening coincided with a tourism slump after the earthquake and blockade last year. However, even with 20 per cent occupancy it is already breaking even. And unlike other hotels The Pavilions was unaffected by the fuel shortage because it runs completely on solar power, uses biogas for cooking, and grows most of its own food. “Our philosophy is to be a part of the community we are in, employ people from the community, have a very small ecological footprint, and provide guests a luxurious off-the-grid experience,” explains manager Rajiv Deshraj Shrestha, who adds this is the most fulfilling job he’s ever had. The resort is a radical departure from other eco-tourism hotels. The bungalows are situated among farm houses, interspersed with corn fields and vegetable patches, and alongside paths farmers use daily to reach their terrace fields. 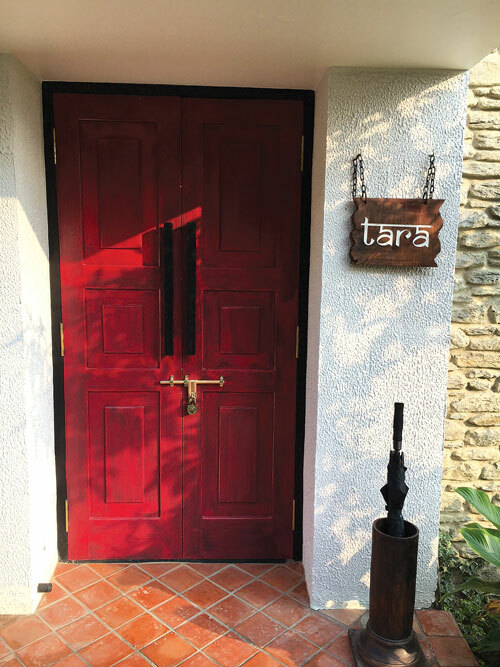 The 12 villas were built mostly from local material, the stones hewn on site, the slate roof is from the valley, timber was locally produced and the Newari-Tibetan interiors were done by local craftsmen. The buildings were designed around the landscape’s contours with minimal landfilling. “I had a very clear ideology to build a boutique resort that would be ecologically and economically sustainable and pay for our social work, it was a labour of love,” Maclagan explains. The elegantly designed club house is well insulated and doesn't need air-conditioning. The Pavilions generates all its own power from a solar array on the roof of the elegantly designed club house. A quarter of the water used is harvested rain, the soapy ‘grey water’ from sinks and showers are filtered and fed into the flush tanks, and the sewage pipes empty into a large underground biogas digester where it mixes with farm manure to generate methane for the kitchen, which would otherwise have used up eight gas cylinders a week. The walls and windows are so well insulated that air conditioners are not required even in the heat of the Pokhara summer. Any plastic used is biodegradable, the toothbrushes and combs are wooden, the shampoo and paper soap are all manufactured locally by Insuba Maclagan from herbs and aromatic plants found in the surrounding forests. She also oversees a farm with 12 cows and buffalos, goats, chicken and even boars that provide meat for the menu and manure for the biogas plant. Effluent from the digesters in turn fertilise the vegetable patches. Maclagan and his wife, Insuba, plan to plough 70 per cent of the profits from the resort to fund projects for disadvantaged children. Douglas Maclagan is endlessly hatching new ideas: his children’s charity has started a radio program broadcast on local FM stations, government schools have children’s clubs, there are children’s books, a Children’s Development Bank is run by abandoned children. He is also upscaling an existing project supported by Mövenpick to finish by next year a hospitality training centre nearby to provide qualified staff for Pokhara’s tourism sector, including The Pavilions itself. The centre will be managed by Kathmandu-based GATE with half the 200 trainees subsidised by fee-paying students. 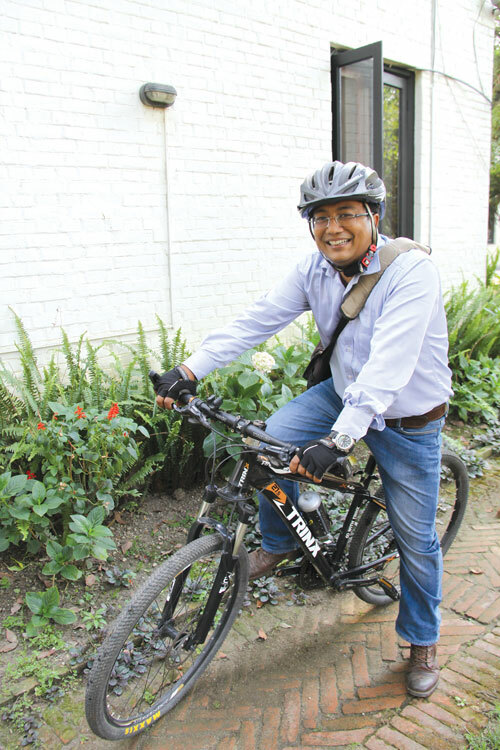 Alex Shrestha (pictured above) grew up mostly outside Nepal, first with his flight engineer father, in school in Darjeeling and studying architecture in Manila. It was perhaps to make up for being away that he had a strong urge to give back to his country. Now he has: next week he travels to Hong Kong to receive the the '40 Under 40 Award' for his design of The Pavilions Himalayas resort in Pokhara. “I have always wanted to come back to Nepal and do something to make my country proud,” said Shrestha, whose Patan-based firm, Wonaw & Associates, was cited by Hong Kong’s architecture magazine, Perspective, for ‘representing a new generation of architects creating a positive impact across the Asian landscape’. The Pavilions Himalayas had earlier been placed among the top four resorts in Asia at the prestigious 2016 Asia Hotel Design Awards in Singapore and has been given membership of Green Pearls, an exclusive handpicked collection of sustainable and eco-friendly hotels worldwide. The two had to think outside the box in terms of energy self-sufficiency. The hotel is completely solar powered, recycles its water, uses sewage and farm waste to generate gas for the kitchen. Clever insulation has made air-conditioning unnecessary so that even when there is a daily fluctuation of 13 Celsius outdoors, the room temperature stays the same. 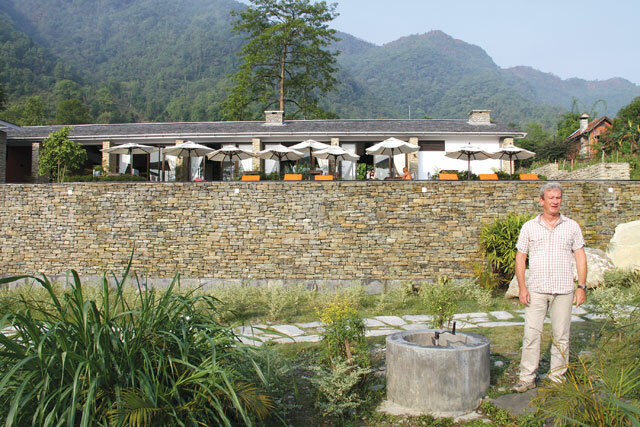 Shrestha was 36 when he started work on the hotel in 2012, and says he was challenged by Douglas Maclagan’s ambition to make one of the world’s most unique hotels not just in terms of design, but also its environmental and social contribution to the community and country. Prime Minister Sher Bahadur Deubas "revolutionary" land reform has stirred Nepals rice basket. Whatever the outcome, it has changed ties between landowners and farmers forever.